Poor performance again, cant get a win atm but at least we haven't lost. 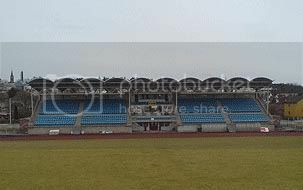 Next game is at home against Valerenga. 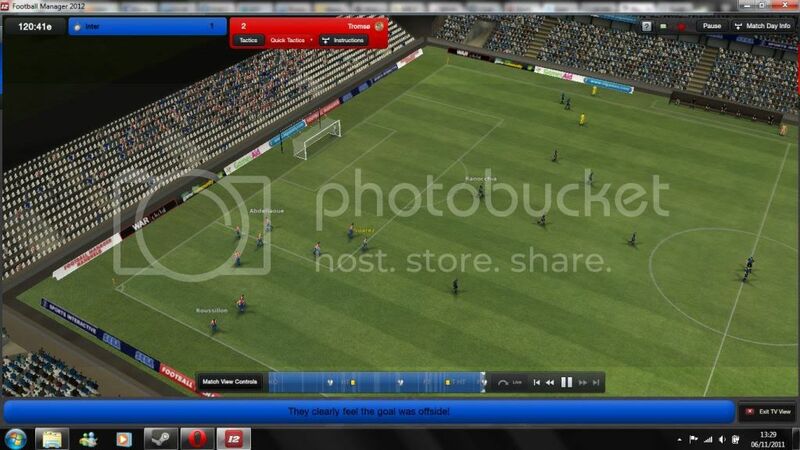 Back to winning ways hat trick from Bjorck, yes he is my CB and no i don't use a corner exploit. Next game is away in the cup to the obscure Vindbjart. Boring win but a win is a win, sure enough I played my reserves now my first XI is rested for the trip away to Sarpsporg (I'm getting a lot of blue teams atm lol). Chairman has now accepted a bid for Ruben Yttergard Jensen, Im up **** creek now but I think one of my youngsters can step in and take his place. Goodbye Ruben, thanks for your service! 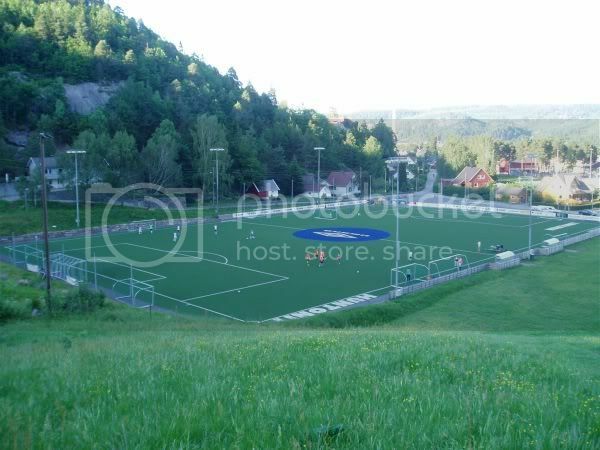 Liam-Shannon i must admit i stopped and started as Molde after your picture of there stadium got me interested, looked at a few pictures of the place and i loved it, but after reading your posts i want to start as Tromso again lol keep updating us with your season news mate! Yes hes a beast a lot of there players are really good tbf like Remi Johansen Im using him to replace Ruben Yttergard Jensen and i Think he has it in him. 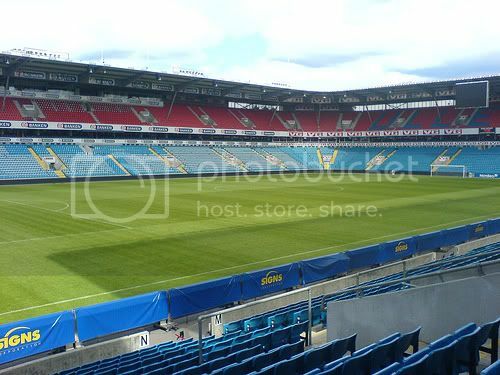 Ye the molde stadium does look very nice indeed flogside tell me how you do too sign Mokoli if you can hes amazing replaced kara with ease. Alright lads i've given up on Genoa for the time being mostly due to having so many players there to get rid of that I can't be bothered to do it as I just want to play games and sell as/when I need It was close between this and Neuchatel Xamax but I always get bored of big money games unless i'm already successful in my own right with a club. I've started in 2011 to give players that extra year to develop (usually i'd start the winter after the main leagues start). As the likes of Kara, Ruben Yttergård Jenssen and Thomas Drage have a few years on their contract i've whacked £100M clauses on their heads so I get a year out of them and if I don't get in to Europe i'll sell at the end of the season to rebuild. My only signing was Andriy Fartushnyak a Ukrainian who can play all along the back four, he was the best I could get for free to cover the RB spot but i'm pretty confident of making a title charge with the squad, especially with Rosenborg losing Annan and Skjelbred over the past year in FM terms it makes things a lot easier. Dexter I really reccomend singing Mobi Okoli if you can hes a beast and on par with Kara. 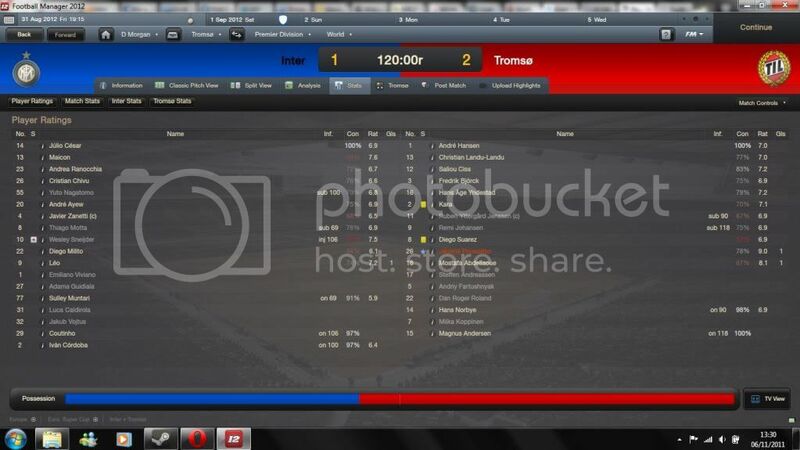 Just played Valerenga In the 3rd round of the cup and beat them 2-1. Good win considering it was away from home. Basically hes a good solid attack minded CM to replace Ruben. Got a big break now maybe for internationals I'll update when I play my next match. I've just been drawn in the Europa League against FC Irtysh Pavlodar from Kazakhstan should be interesting, I expect to win but the first leg is at home which could be a handicap. Good solid win as expected now to wrap it up away from home. Next game is at home to FK Haugesund. 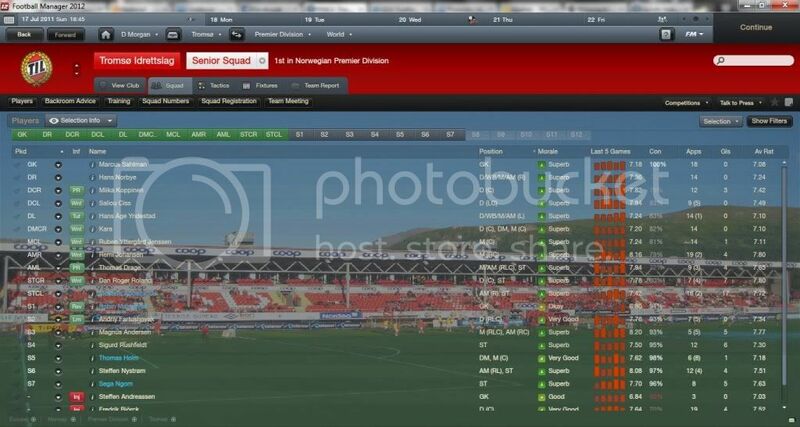 Liam-shannon im going to put my Molde game on hold and start a fresh with Tromso, liking this guide alot and the thread seems active, liking your posts! Any chance you could let me know what tactics your using or upload them mate?? Would be much appreciated! How much have people been getting for Kara?? I want a few funds to replace anyone my chairman lets go! Unfortunately as I have kept the starting squad together I have nothing to spend, i'm relying on us avoiding the big guns in the Europa just to help keep us afloat (over £1m in the red in July and that's without buying anybody) I must admit he does look good for this level though and I will certainly look at him as a replacement if I was to lose Kara. I'm sure overall you've been getting more goals than me browsing at your report Liam, but i'm chuffed with the football we have played. We've dominated most games and if I had stronger strikers there's no doubt we'd have won every game and had more in total considering the chances we have made. We're still in the cup where it has been entirely a reserve team and in the 3rd Europa round. I am going to throw everything at making the group stage and then if we have a decent group i'll give getting out of it a shot as long as it doesn't compromise our league position. As I just said i've been using the whole squad bar 1 or 2 and none of them have let me down when called upon as you can see in their ratings. Where are people sending their scouts? I have 2 16 ca/pa 1 15 ca/pa and a 12 ca 16 pa sent out between Scandinavia, South America North and Western Africa as I feel it is pretty much in touch with real life ATM. Actually really pleased this thread was made. Tromso is probably one of the places I want to visit most . 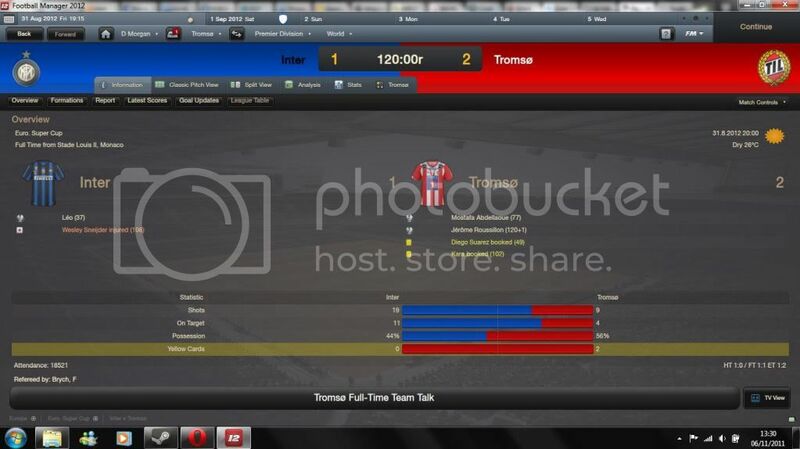 Nice thread, may give Tromso a go sometime, was one of my better saves on FM11, nearly got to CL Final. Fantastic effort by the players this season for the most part, I am annoyed that we tend to get cocky against smaller teams though and I am going to try and fix that this season because up until the last 6 games it could have punished us in the league just as it did in the cup semi final when we lost to a team from the division below. We managed to get out of the Europa group stage but as with our domestic form we won games we should have lost (Benfica 2-0 away 3-1 home) and lost games we should have won/at least got something from, RB Salzburg (1-3 away 0-1 home) Zurich (1-2 away) Next up is Bilbao, which is looking a tough one at the moment as they are 3rd in Spain but if our squad keeps performing as it has in the big games then i'm sure we'll at least make a fight of it. As you can see Abdellaoue was a beast, i'm hoping to get him full time next season as he absolutely tore the league apart. Financially we are in the black again with the Europa run, so we have nearly £2m in the bank which should keep us steady until the sponsorship money comes in. I have a few targets in mind and already have brought in a Cameroonian striker called Abdoul Hamissou on a free who my scout says is 5 star potential. I'll post a screenie of him and any other signings once my budget is confirmed. Great season dexter no one stole Kara or Yttergard Jensen off of you?! Lol I've lost both and Im only half way into the season. Just sold Kara for £3 mil to Bursaspor (925,00 up front) and Sahlman to Southampton for £1.2, the board gave me £800,000 if that to spend. 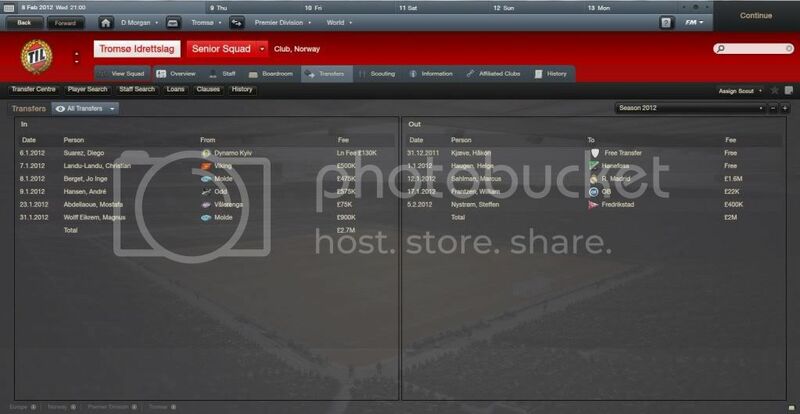 Put in bids for Okoli, Egil Flo, Soukouna plus already bought Sone Aloku. Also put in a bid for Bandalovskiy as in need of a RB. Im just on the lookout for a few new players, bringing some in on trial, need a new goalkeeper asap. Still trying to find some tactics, ive used a few on here and trying to tweak them, tactics are not my strongest point! Set up friendlies, bought staff, just need to set up training next. This looks like a fun save!! Nice season Dexter_Morgan are you using 2 up front or just one? What role have you got Abdellaoue? Johansen looks excellent!! I feel the ins bring greater depth to the squad and a largely home based contingent which is always my aim when possible. In regards to other players at the club it is a large amount, but with the Champions league to come with any luck they'll pay for themselves. I've removed the £100M asking price now and set to reject anything less than £6M which I think is fair considering Diouf went from Molde to United for just over that in real life and both are more valuable to the team than he would be if I was to sign him. Rushfeldt is tutoring him and his determination has gone up 2, finishing, pace, strength and composure by 1 since he joined already. All upfront bar Landu-Landu who is over 24 months. flogside, i'm playing a 4-2-2-2 (wingers) the strikers swap positions throughout the game, the striking positions are poacher and advanced forward (so obviously he changes between the 2) I originally made the tactic for Red Star Belgrade on last years game and it was also used with Halmia and Dinamo Zagreb, Dinamo Bucharest and Halmia with good effect. For anyone that wants to try it You can swap midfield and winger roles too and it makes no difference. Thank you for the advice and tactic Dexter, much appreciated! I freely admit tactics have never been my strong point lol looking to bring in Petter Bruer Hanssen on the wing as missed out on Soukouna unfortunately who was very good in pre season in my Molde save! Ive given Fartushnyak a go also, see if he accepts! That regen looks awesome btw, ive had no such luck yet! Africa seems a good place to pick up free/cheap regens again flogside (I've not even loaded players from there) I've got another 4 i'm interested in but they aren't even 17 yet so i'm hanging on 6 months or so and will have another look. I've added Brazil this year so I can at least scout the youth competitions properly but it looks to have backfired as nobody is interested now compared to the ones I could have got before. After being battered for just over 125 minutes of football over 2 ties by Bilbao we managed to escape with a 1-1 draw at home and then won 1-0 at San Mames. I'm still unsure how it happened but when we have the ball we are quick and efficient with it which obviously helps. Olympiakos are next and in my eyes this is a winnable tie, i'm just hoping that the new faces have helped to get rid of complacency that we previously had but have the same big game mentality last years squad had. Next up is Metalist who on paper are the easiest team left but have just beat Sevilla 3-1 on aggregate. That is damn impressive Dexter! 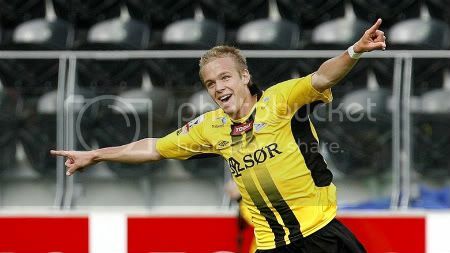 I havnt had the chance to carry on yet and wont for a few day, itching to get going again with Tromso! Cheers lads, been tough in the last few rounds, I'm sure we've been behind at some point in every knockout game and considering how strong our defence is domestically it shows the difference in class when playing the bigger teams, luckily we have a strong midfield duo, 2 good wingers and half decent forwards to make up for it. Semi-finals, nice!! The financial bonus of getting that far must help! Im going to use your tactic with a few others from elsewhere that i very slightly tweaked as backup! Ill take getting to the group stage let alone the semi's!! Can you give a run down on your transfers, when you get a chance. Sure Joe, no outs in 2011 and only Andriy Fartushnyak in on a free. I can't rate him highly enough at least for the start, he was originally only signed to provide cover but I had him tutored by Miika Koppinen and let him start games and his attributes rose quickly. These are my 2012 ones so far but I am looking at boosting the squad for the CL now we have a good amount of money in the bank. Hello guys, I was just searching for a new team to play as, until I found this thread. Started as Tromso this morning and I'm loving this even though I'm only 2 games into the season. I didn't make any transfers in the first transfer windows as i felt the current squad was more than capable of being in the title challenge. First game of the season was an away game vs. Stromsgodset which I won 1-3 with goals from Sigurd Rushfeldt & Abdellaoue x2. Solid win there. 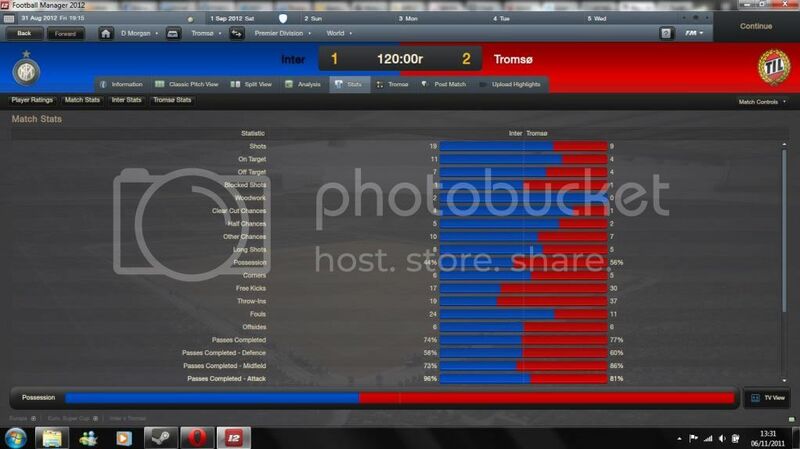 Next game was the clearly the best game I've played in FM 2012. 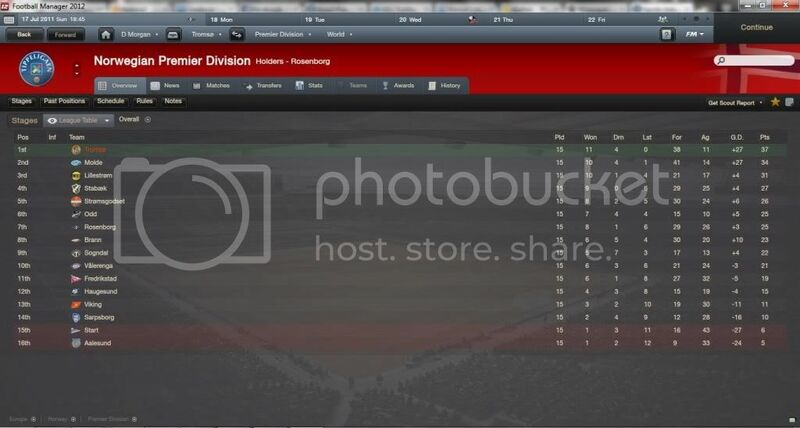 Home game against Rosenborg where both of my DC's were out injured, so Roland & Rinde came in. I'll try to be active in this thread! Welcome to the thread and forum abed, Tromso is a very fun save from my season and half experience so far, granted I over achieved a little with the Europa league win but even without that i'm enjoying buying different players and watching the football we play Good result against Rosenborg there, I beat them by the same score in my first season so hopefully that is a good omen for you. Great thread gents, during my Rangers save i've came across a bundle of good Scandanavien talent and thanks to this thread and welsace's list thread of cheap players from that region i'm now on the verge of starting a game with Tromso. 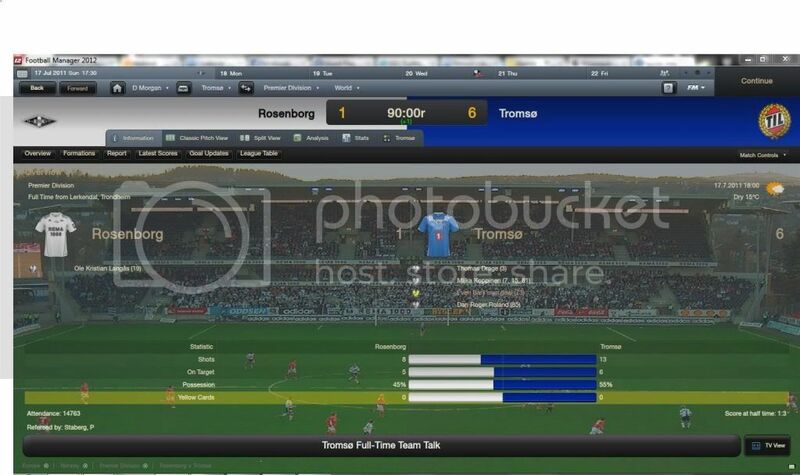 Usually my team from that point in Europe is Randers of Denmark but Tromso looks really fun. Dexter, any idea's on who'll you replace Kara with? Have you looked much or at all at Mobi Okoli? 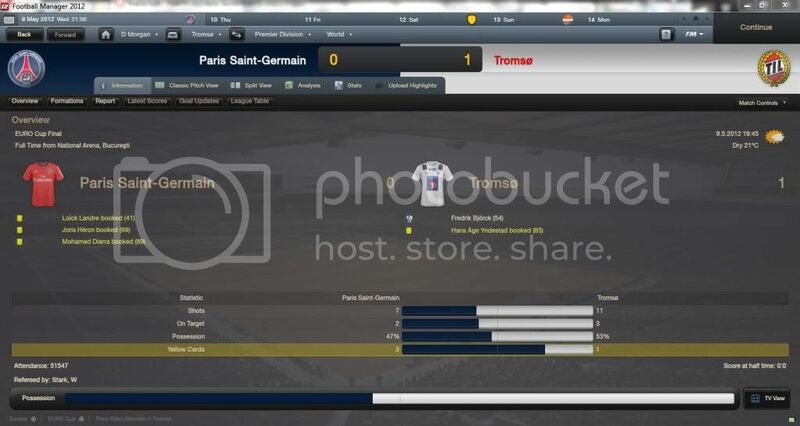 Ive really struggled to get into FM for the past 3/4 versions and was worried this might be the same with 2012 but this Tromso save and thread have really ignited my love for the game, along with the game changes of course. Hiya guys decided to start a new game with Tromso, just wondering where you guys got the facepacks.logos etc from so I can download them to enhance my experience, any help would be greatly appreciated. Hope you go for it mate, there's lots of talented players in Norway once you start making money. Kara is on a 5 year deal now so there's no rush to get a replacement unless I find someone who can play close to his current level straight away and potentially be better or if he moans about joining a bigger club (even then if I don't get £5M+ I'm not going to let him go easily. 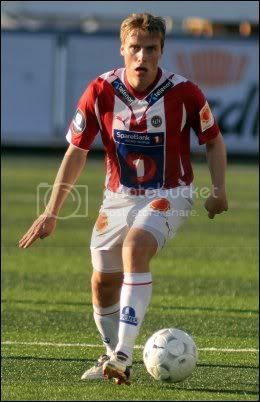 I am really happy that I've found this thread and all the posts from Liam-Shannon made Tromso very interesting team to manage. We are doing well in the league but we are drawing too many games where we are the much better side. Still unbeatable though. The chairman took advantage of the bid Ajax came in with for Yttergård(£2.7m) in the middle of the season so I decided to bring in Obodai, Anthony & Kargbo, Ibrahim, both for free. We have won our way to the 4th round in the Norwegian Cup where we will play Aalesund. In Europa League we have knocked out Olimpija & Iscra Ríbnita. In the 3rd Qualifying Round we got drawn against Stoke so we will have to do very well if we want to get into the Group Stage. Thomas Drage & Abdellaoue have been my best players so far, Drage (7.50) in 19 games & Abdellaoue (7.42) in 17. EDIT: Some of my starters are getting injured now! First in April Remi got injured for 4 months, now Kara is out for 4-5 weeks so he'll miss both games against Stoke, Magnus Andersen is expected to be out for 3-4 months, and Thomas Holm 4 months.. Sorry for a double post but.... I didn't expect that performance! Especially with important players out injured!! EDIT: Through to the next round! Brilliant result there abed and good start. We was missing Drage, Eikrem, Hedenstadt and Berget to internationals as well which made the result more impressive. I know i'm over achieving and someone called me out on another forum which is why I provided the extra screenshots this time, plus I uploaded a link to the tactic and the game 3 days before the final to show I have nothing to hide.